Board your flight from Kolkata and land in Brunei at 04:00 P.M. Transfer to the hotel. Rest of the evening at leisure. Dinner at a local restaurant near your Hotel. Overnight in Brunei. At around 07:30 A.M., start for Temburong National Park, located in the heart of a 500-sq-km area of pristine rainforest covering most of southern Temburong. It’s so untouched that only about 1 sq km of the park is accessible to tourists, who are only admitted as part of guided tour (9 hours duration). Picnic lunch will be served in the Eco Village post an uphill trek to the Canopy Walkway. Visit the waterfall after lunch if weather conditions permit. Back to the hotel by evening. Dinner at a local restaurant near your Hotel. Overnight in Brunei. After a leisurely breakfast, start for a 4 hours tour of the city and Water Village. Highlights include visit to the morning open market “Tamu Kianggeh”, the Majestic Sultan Omar Ali Saifuddien Mosque, the Royal Regalia Exhibition Hall, Malay Technology Museum, Jameasr’ Hassanil Bolkiah Mosque and photo stop at the main entrance of the Royal Palace. Lunch will be served at a local restaurant after which visit Yayasan Shopping Complex. 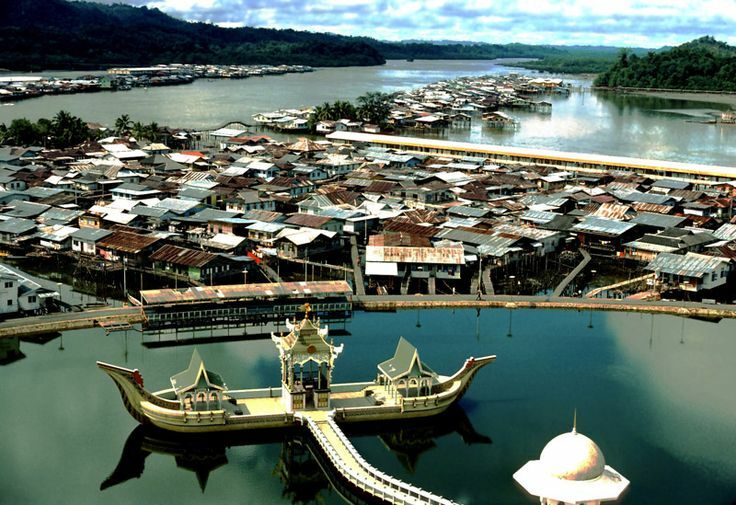 You will also be taken on a scenic boat ride to the world’s largest water village .The water village perched on the Brunei River and is home to around 30,000 people. Even centuries ago, the size and complexity of the Brunei Water Village greatly impressed the Magellan expedition which received a stately welcome upon entering Brunei Bay in 1521. Most of the houses on stilts are now furnished with every modern amenity, but the tranquility and serenity of a typical Malay village remains. Tea with local delicacies will be served in a house in the Water Village. Back to the hotel by late afternoon. Rest for some time and then that start for “Brunei – Night Tour” (3 Hours duration). This leisurely evening tour will take you through Bandar Seri Begawan to see thelighted landmarks of the city. Stop at an open market in Gadong to see the many colourful and varieties of fruits (depending on the fruiting season), vegetables. You get to see various types of food, some being cooked or grilled on the spot. Proceed for dinner at a local restaurant. After dinner, do a brief stop at a shopping mall before your drop-off at the hotel. Overnight in Brunei. After a leisurely breakfast, start your return journey to Kolkata. You will be transferred to the Airport for your flight at 04:25 P.M. Tour ends will unlimited memories. Find Out The Latest Travel Trends And How It Reflects On Your Travel Plans!